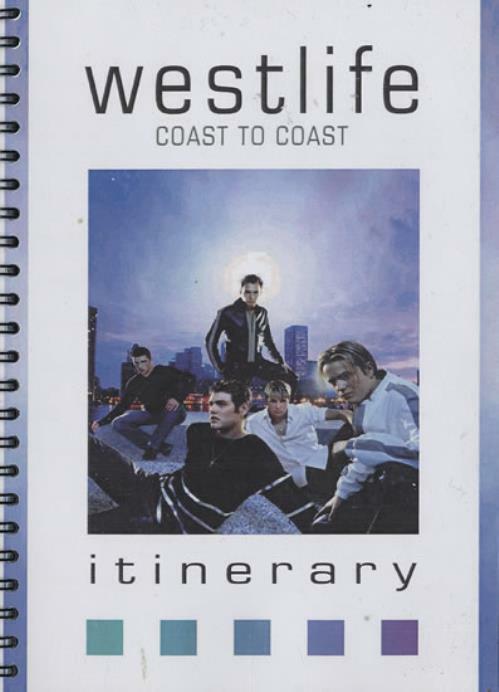 WESTLIFE Coast To Coast Itinerary (Original 63-page A5 sized spiral-bound tour itinerary book for the 1st Februaryl to 31st March UK tour. which lists the band possibly doing 10 nights at Wembley Arena. Includes details on tour dates & venues, Crew & Band member listing, hotel & travel arrangements for both band & crew and more, complete with the original front colour cover and front clear protective cover laminate. This would have only been issued to crew/people involved with the tour, and were not for sale to the general public. In most cases less than 100 copies were ever made).